A lovelorn student Kim Hyeon-gon falls for a waitress at a local coffee shop but unable to approach her hires the “Cyrano Agency” a small company owned by theatre actor Lee Byeong-hoon to help win her affections. Through constructing scenarios and communicating through a headpiece the agency is successful. Financially though they are struggling and take on the case of fund manager Cheol-bin who has fallen for Kim Hee-joong a woman he met at the local church. Lee Byeong-hoon is reluctant as she is a former girlfriend and as the Agency set to work he finds his emotions starting to affect his professional ones. The Original Cyrano De Bergerac story sees the titular character called upon by his colleague Christian to help woo Roxanne. Cyrano is also in love with Roxanne but feels unable to declare this due to his physical appearance. Most variations of the Cyrano story tend to pitch the audience sympathies with the “Cyrano” character and initially this appears to be the case here with the “Christian” Character (Cheol-bin) presented as the obstacle and not worthy of the Roxanne’s (Kim Hee-joong) affections. However, as the narrative progresses we see a much more flawed individual in Lee Byeong-hoon and Cheol-bin is allowed to develop from being the fall guy placed in embarrassing situations to the point where during the film’s most emotional scene is able to find his own voice and an identification with a character so often derided. Daniel Choi captures this scene perfectly showing just the right amount of awkwardness and emerging quiet confidence to simply be himself. 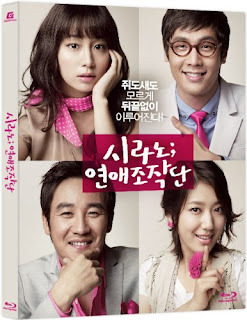 Uhm Tae-woong carries the movie ably as the initially confident owner of “Cyrano Agency” and manages to maintain sympathy as Lee’s flaws and the truth around the original break-up is revealed. Lee Min-Jung as the independent Kim Hee-Joong makes you understand how she is able to capture the affections of both leads and has a lovely character quirk about cigarette lighters that pays off in a gentle throwaway aside in the climax. There are a few sly asides at the nature of “romantic” love and how it can be an illusion. The opening scenes showing the agencies manipulation of circumstance have a light comical tone but have a dramatic pay off later. As the main story arc progresses we again see the difference between reality and the idealized nature of love with the end message of acceptance of yourself. The characters are portrayed as recognizably human which provides an emotional investment in the outcome. There is a warmth to the movie which is matched by the soft hues in the cinematography which only adds to its charm and likability. The end result is a genuinely engaging romantic comedy that is a pleasure to watch.